At home on a narrow-lot, The Leland is fifty-feet wide and features a front-entry garage. This two-story home makes a lasting first impression with multiple gables that draw the eye upward. A metal accent roof and columned front porch complement this low-maintenance exterior. An open dining space flows nicely into the exceptionally spacious island kitchen. The great room facilitates relaxation with a fireplace and views to the rear, while multiple doors access the skylight-topped porch. Additionally, a mud room, utility room, and various closets create a multi-function work station to keep busy families organized and on-task. The master suite is upstairs with over-sized walk-in closets and a luxurious bathroom. Find three additional bedrooms upstairs and a bedroom/study, convenient for guests, on the first floor. 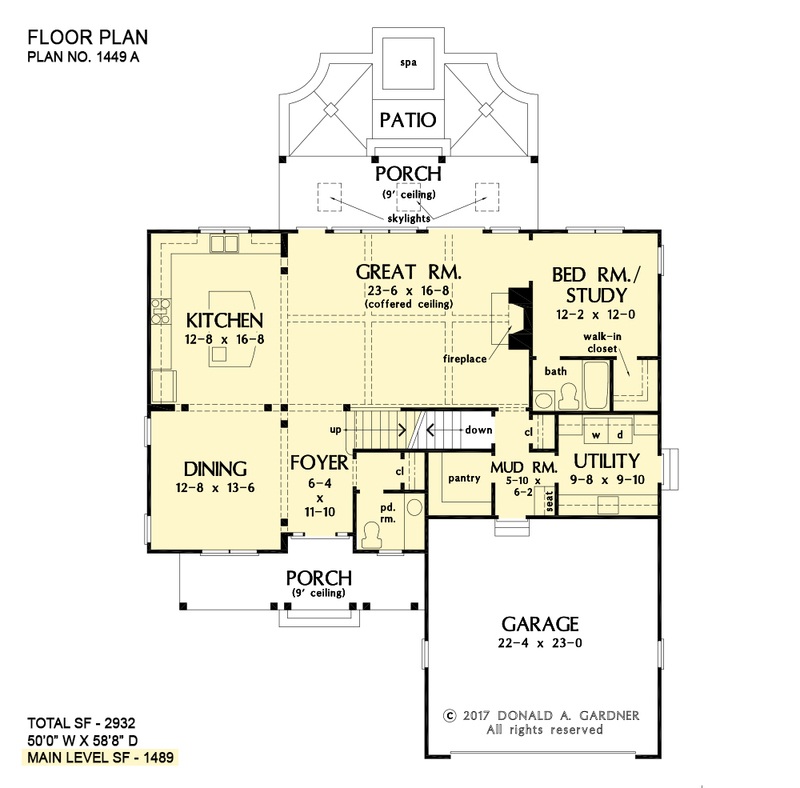 1st Floor: 1489 Sq. 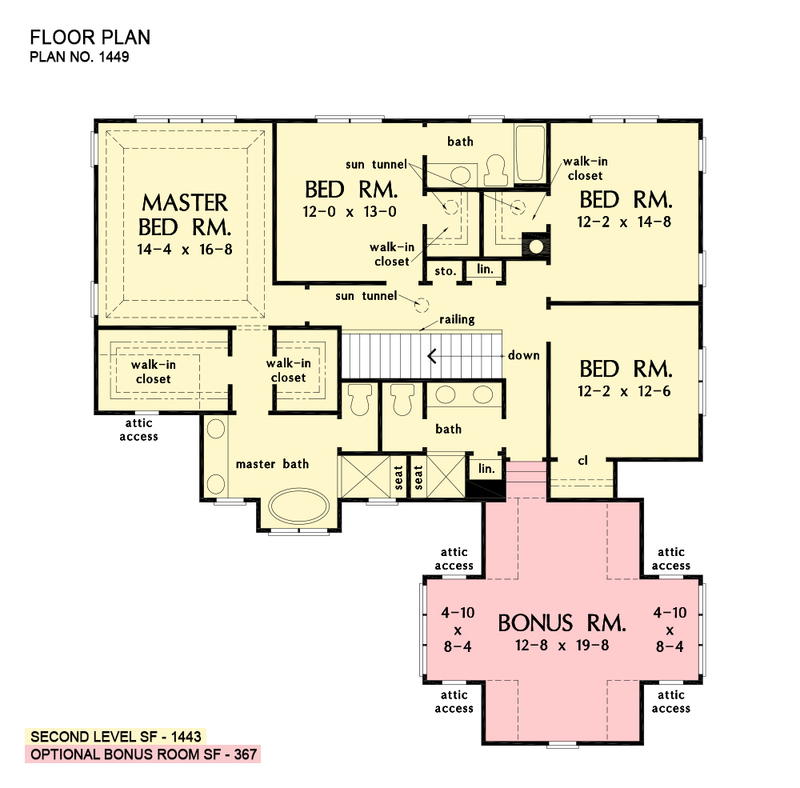 Ft.
2nd Floor: 1443 Sq. Ft. Bonus Room: 367 Sq. Ft.
Porch - Front: 142 Sq. Ft.
Porch - Rear: 180 Sq. 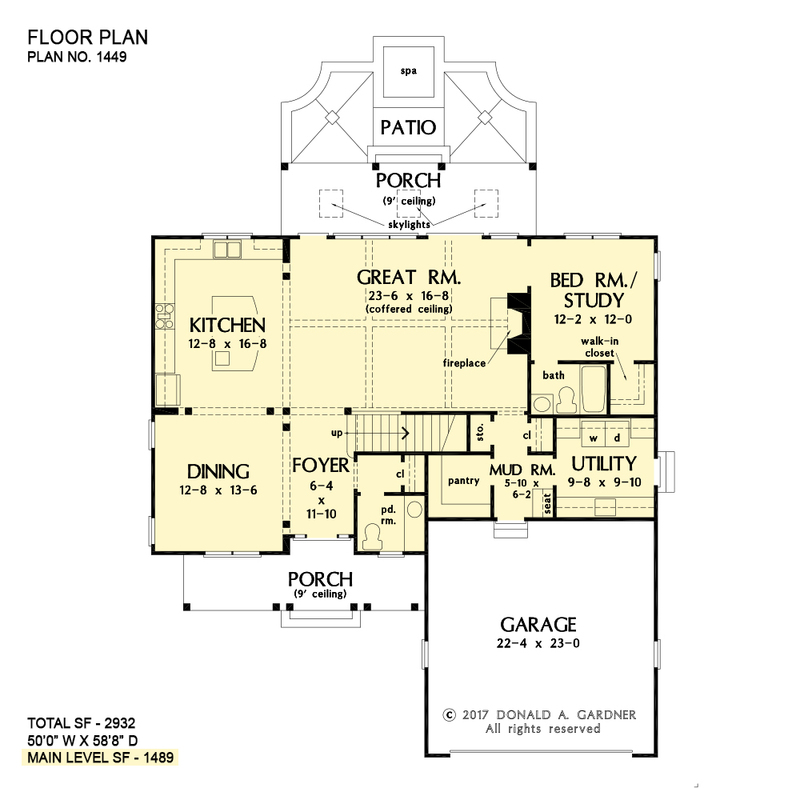 Ft.
House Dimensions: 50' 0" x 58' 8"
Great Room: 23' 6" x 16' 8"
Master Bedroom: 14' 4" x 16' 8"
Bedroom #5 (Flat): 12' 2" x 12' 6" x 9' 0"
Storage (2nd Fl.) (Flat): 2' 11" x 1' 8" x 9' 0"
Mud Room (Flat): 5' 10" x 6' 2" x 10' 0"
Storage (1st Fl.) (Sloped): 2' 0" x 3' 8" x 10' 0"
Foyer (Flat): 6' 4" x 11' 10" x 10' 0"
Dining Room (Flat): 12' 8" x 13' 6" x 10' 0"
Great Room (Coffered): 23' 6" x 16' 8" x 10' 0"
Kitchen (Flat): 12' 8" x 16' 8" x 10' 0"
Utility Room (Flat): 9' 8" x 9' 10" x 10' 0"
Bonus Room (Clipped): 12' 8" x 19' 8" x 8' 0"
Garage (Flat): 22' 4" x 23' 0" x 0' 0"
Master Bedroom (Tray): 14' 4" x 16' 8" x 10' 6"
Bedroom / Study (Flat): 12' 2" x 12' 0" x 10' 0"
Bedroom #4 (Flat): 12' 2" x 14' 8" x 9' 0"
Porch - Front (Flat): 23' 10" x 5' 6" x 9' 0"
Porch - Rear (Flat): 25' 2" x 7' 2" x 9' 0"
Deck / Patio (None): 25' 2" x 10' 0" x 0' 0"